Introducing Our Mini Explorer | Where Is Nikki? It’s been over three months since we welcomed our mini explorer, Amelie Rose Jackson Mmari, into the world. Just like her dad, she arrived on “Tanzanian Time”, eleven days late on Saturday 10 February at 9.29am, weighing a whopping 9lbs and 12oz. The months that have followed have been a completely new adventure and I have loved every second of being a mum (well perhaps with the exception of the sleep deprivation and poop explosions). Our little bundle of joy is a complete dream, and although I am biased, I can’t help but stare at her for hours and melt over just how beautiful she is. Creating a human being is truly a miraculous thing, and I still can’t quite get my head around how we made something so perfect! And yes, that mop of hair! She came out with gorgeous long dark locks, so the months and months of heartburn were completely worth it in the end! She is just the happiest, smiliest little baby and has been so alert and on the ball since day one. Even the midwives were surprised by how forward she was from just a few days old. As each day passes her smiles keep getting bigger and she just gets smarter and chattier. Sometimes I really have to remind myself that she is only three months old! Needless to say, we are TOTALLY smitten and in love. I will spare you all the gory details about the birth itself. But I will say that although it didn’t turn out to be quite the natural water birth I had hoped for, it was still a truly magical experience. I must be mad to say this, but despite the undeniable crippling pain a mother goes through during labour, I would do it all again just for the moment I got to look into her eyes for the first time. Having my parents around for the first two months of Amelie’s life was truly special. It was a unique situation in the sense that they got to spend so much time with her and it was wonderful for me to see them form such a close bond. My mum, in particular, was my rock – she was there for me during the labour and helped out on many occasions to give me some much-needed rest. Without their support, I am certain I would have been a broken woman! However, on the flip-side, those first months were also quite challenging for me and the father as unfortunately, he couldn’t come to the UK due to various visa constraints. Long distance relationships are tough at the best of times, but trying to be new parents from afar as well…that was pretty hard. I can only imagine how much more difficult it must have been for him, not being able to cuddle his daughter and only seeing her on FaceTime. But while it was hard, I was thankful to have my friends and family around me who always show their unconditional support. And luckily Amelie kept me on my toes enough for the time to pass quickly and before we knew it, we were embarking on our first big adventure together and hopped on a plane to meet daddy for the first time! I already have a feeling that Amelie is going to be a natural explorer – she took everything in her stride and was as good as gold throughout the entire 15-hour journey. A journey I was completely dreading with a young baby, but my little girl did me proud! At the end of the flight, it was lovely how all the hostesses and other passengers complimented Amelie on how well she behaved. When we finally arrived at Kilimanjaro Airport in Tanzania, it was an emotional reunion, to say the least! And while it took Amelie a few days to settle into her new home and get to know her daddy, it’s been lovely to see their relationship grow over the weeks. So why Amelie Rose Jackson? So what about Jackson Mmari? In Tanzanian tradition, it is common for children to take both of their father’s names. Regardless of whether they are a girl or a boy! Although Jackson couldn’t quite get his head around the reasoning behind my random middle name choice, and I couldn’t understand why it was important for our daughter to take both his “boy” names, we decided to meet in the middle (like many things in an intercultural relationship!!) and hence Amelie Rose Jackson Mmari was born. The blogging and social media activity has definitely slowed down in recent months as Amelie has been keeping us very busy! 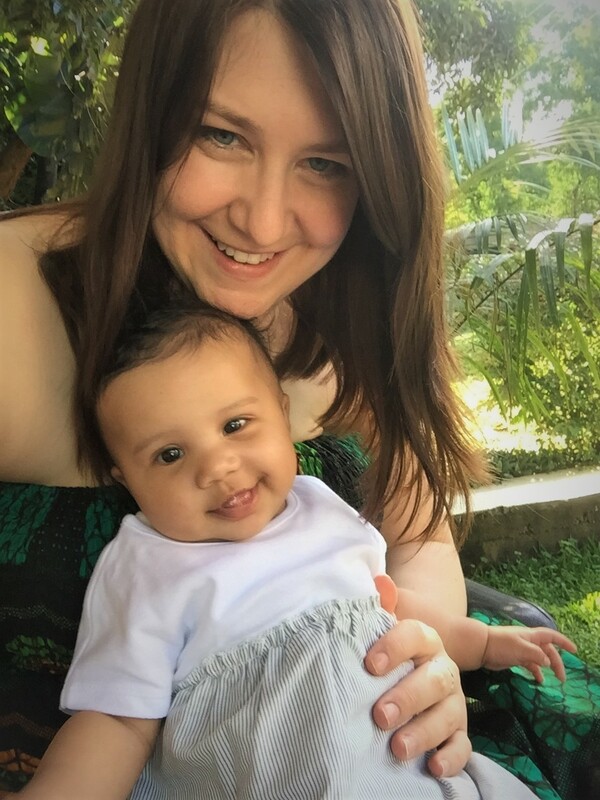 But I am sure as things get more settled, I will try and find the time to share more about life in Tanzania as “Mama Amelie” (it’s a tradition here for mums to be called the “mother of” their firstborn’s name). One thing is for sure, we can’t wait to start showing Amelie more of the world and we hope she will enjoy exploring just as much as we do. So watch this space! Can Travelling Solo Really Heal a Broken Heart? Aw thank you Claire, that’s really sweet! What a coincidence that they share the same name! Lovely! Great minds think alike! We’ll have to set up a play date!